Early spring is when parking permit rates are proposed and approved for the upcoming academic year. For the THIRD year in a row, the recommendation is that the cost of UNC Charlotte parking permits remain the same. That's right, NO INCREASE! This is welcome news, especially to those who remember that prior to 2014-15, permit prices rose five to eight percent every year. The price of UNC Charlotte parking permits is determined by how much will be needed to support a ten-year financial plan that will pay for parking that accommodates enrollment. Although enrollment continues to increase, parking availability is meeting demand (recent space count data proves this) as more students avail themselves to remote parking options, taking campus- or apartment complex-provided shuttles, ride sharing, walking, and biking. As a result, there's no need to plan, build and pay for additional parking facilities at this time. "The parking at UNCC is ridiculous," someone Tweeted just before 11 a.m., the first Monday after Spring break. It's very likely that student was looking for a space in or near Union, West or East parking decks and all were full, just like any other weekday morning when classes are most densely scheduled. The competition for close-to-class parking, made worse by those who stubbornly circle full decks and lots instead of moving on, makes her Tweet ring true. But it doesn't have to be that way. There's plenty of parking available in other areas. 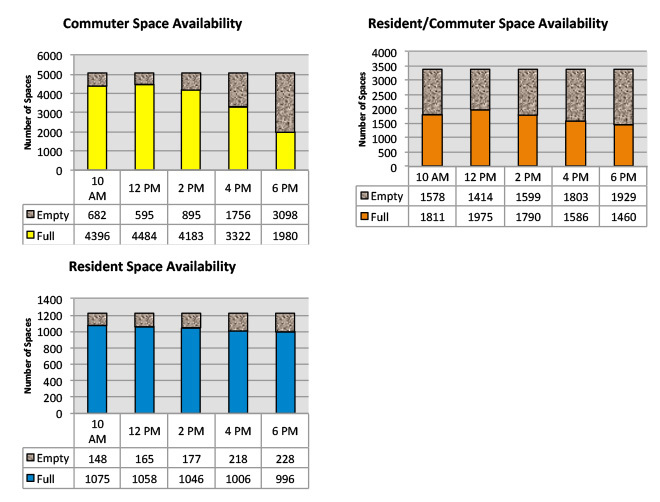 Space counts, which are taken regularly, show that UNC Charlotte has sufficient parking for visitors, faculty, staff, and students. Students are the population who most heavily use parking and for whom most of the parking is designated. Here are the numbers for Spring 2016, Monday - Thursday. * Italicized rows are areas that tend to fill at peak class times. Bold entries have the most parking to spare. Everyone wants to park as close as they can to their class and most classes are scheduled from about 9 a.m. to 2 p.m.. Therefore, more students are trying to park in the same places at the same time. Your competition is stiff. Take a look at the Commuter parking areas in bold. They are generally the least crowded and every one of them has a shuttle stop. For just one day, try parking in Lot 6, North Deck or South Village Deck. The Red Line runs three buses from Lot 6 through the center of campus via the Student Union and out to the CRI campus Monday through Thursday (two buses on Friday). You can catch the Green Line from North Deck and both the Yellow and Green Lines from South Village Deck. Download the UNCCNextRide app or access the NextRide mobile web site you view where the shuttle is and when it will get to your stop. It feels counterintuitive to park farther away from where you're going but just try it ONCE. You will likely find it doesn't take much longer and that it's less stressful to easily find parking in a lower-demand area and take the shuttle or walk to class. Once you've tried an alternative parking area, it won't feel as annoying to park there on days when your preferred parking is full. The first ten permit-holding Commuters who park in one of the bold areas and Tweet a selfie of their car parked there, mention @unccparking and/or use hashtag #parkedfar, will get a deck voucher for one day of free visitor parking at a Visitor deck. (Visitor deck areas are at Cone, East 1, Union, CRI 1 and South Village). That might be really nice to have for that day when you're running late. CHARLOTTE, N.C. — University of North Carolina at Charlotte blood drive organizers are aiming for a new record this year: 1,000 pints of blood collected at the annual 49ers4Life blood drive on Tuesday, Jan. 26. Previous blood drives have come close but never surpassed the 1,000-pint finish line; last year’s drive yielded about 800 pints. This year, organizers are hoping that students, alumni and community members respond to the call for blood donors by rolling up a sleeve and donating. “Winter is one of the toughest times for the Red Cross to collect enough blood to meet patient needs,” said Ryan Corcoran, donor recruitment director for the Red Cross. “When the UNC Charlotte community comes together for this drive, they can help boost the blood supply – and ultimately offer hope to patients in need of blood transfusions.” The American Red Cross has an urgent need for blood and platelet donations to prevent a shortage this winter. Busy holiday schedules in November and December contributed to about 1,700 fewer blood drives held across the country compared to the two previous months, which has resulted in about 50,000 fewer donations and reduced the blood supply. Donors can help mitigate this shortfall at the blood drive on Tuesday, Jan. 26 from 8 a.m. to 7 p.m. at UNC Charlotte’s Barnhart Student Activity Center, 9201 University City Blvd. 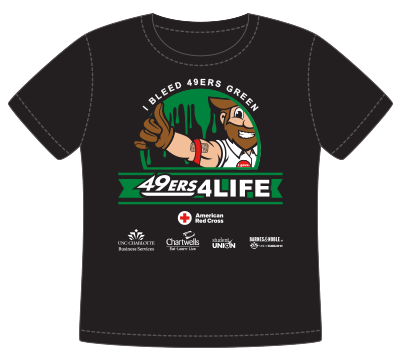 Those who come out to donate blood will receive a specially designed “I Bleed 49ers Green” T-shirt, while supplies last, and be entered to win additional prizes like spirit gear from Barnes & Noble at UNC Charlotte bookstore. Since 2010, the college has hosted the drive to help increase blood donations during the challenging winter season. Seasonal illnesses, like the flu, can cause some donors to become temporarily ineligible to donate, and winter weather can lead to canceled blood drives. Despite these challenges, patients still depend on lifesaving donations every day. Shamari Inuwa is one of those patients. 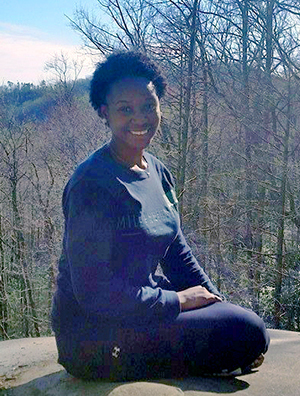 Shamari, a recent UNC Charlotte graduate, was born with sickle cell disease, an inherited red blood cell disorder. Red blood cells carry oxygen to all parts of the body. People with sickle cell disease have abnormally shaped red blood cells, and the condition can cause anemia, tissue and organ damage, strokes and pain. In high school, Shamari began experiencing numbness in her hands and feet, sometimes just for a few seconds. But over time, the loss of feeling in her hands and feet increased in frequency and duration. In the most severe episode, she stood up after class and felt half her body go numb. Extreme pain brought her to the emergency room, and doctors discovered that she was experiencing mini-strokes. Shamari needed a blood transfusion immediately. “That initial transfusion saved my life,” she said. Shamari began receiving transfusions about once per month to reduce the risk of further mini-strokes, called transient ischemic attacks. She has continued the treatment over eight years—for a total of nearly 100 blood transfusions. “The transfusions have enabled me to have a normal life and successfully complete college, despite my illness,” she said. Shamari, who graduated with a degree in biology, hopes to use her education and personal experience to help others in the healthcare field. She’s an advocate for sickle cell disease research, and hopes to work toward more treatment options for the disease that affects as many as 100,000 Americans, according to the Centers for Disease Control and Prevention. Organizers recommend that donors schedule an appointment for this blood drive by visiting redcrossblood.org and entering the sponsor code “49ers4Life,” calling 1-800-RED CROSS or downloading the Red Cross Blood Donor App. To make an appointment, download the free Red Cross Blood Donor App, visit redcrossblood.org or call 1-800-RED CROSS (1-800-733-2767). Donors can use RapidPass to complete their pre-donation reading and health history questionnaire online, on the day of their donation, from a computer or laptop. Visit redcrossblood.org/RapidPass to get started. Individuals who are 17 years of age (16 with parental consent in some states), weigh at least 110 pounds and are in generally good health may be eligible to donate blood. High school students and other donors 18 years of age and younger also have to meet certain height and weight requirements. Here's a great deal for students who enjoy the convenience of dining on campus. Commuters may find it especially beneficial and Faculty and Staff may take advantage of this promotion as well. Bonus meal swipes may be used at SoVi Dining in South Village Crossing and Crown Commons in the Student Union, Monday through Sunday, for any meal period. Optional Dining Account funds do not expire (ODA rolls over from semester to semester, year to year) but bonus meal swipes expire May 11, 2016. Deposited amount will show up immediately; bonus meals appear on the card by the following Monday. For questions or assistance, call the 49er Card and Meal Plans office at 704-687-7337 or email 49ercard@uncc.edu. A new parking garage is being built beside the UNC Charlotte Center City Building. During this construction phase, parking spaces for CCB patrons have spread over multiple lots, resulting in times when permit-holders are challenged to find the spaces available to them. Lot 422, which is across N. Brevard Street. CCB patrons who currently park in Lot 300, between CCB and the light rail line, will be asked to park in Lot 319. This change offers a better overall parking experience and maintains the number of spaces available to UNC Charlotte Center City. When the new parking facility is complete, CCB parking will be moved there. Parking for UNC Charlotte Center City Building is provided through an arrangement with Preferred Parking, Inc. Questions regarding this change of arrangement should be directed to UNC Charlotte Center City administration, 704-687-8902. UNC Charlotte students, faculty and staff will again team up with the American Red Cross in a campus-wide effort to bleed green and save lives. This year’s collection goal is 1,000 pints. 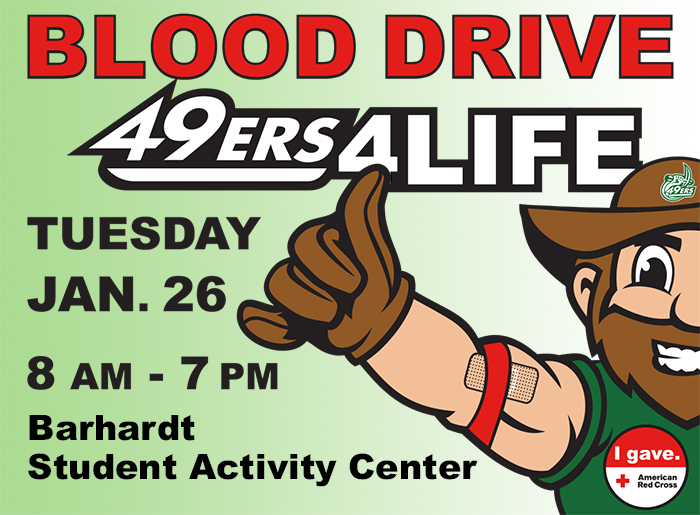 Those who come out to donate blood will receive a specially designed “I Bleed 49ers Green” t-shirt and be entered to win additional prizes like spirit gear from Barnes & Noble at UNC Charlotte bookstore. Every two seconds, someone in the U.S. needs blood. Accident victims, premature babies and patients with cancer, sickle cell disease, blood disorders and other illnesses are among those dependent upon transfusions in order to survive. For more information or to schedule an appointment to donate, please call 1-800-733-2767 or visit redcrossblood.org and enter sponsor code 49ers4Life. UNC Charlotte is among several N.C. colleges and universities that collect blood with the American Red Cross; school spirit adds a cheery bit of competition to the drives. Appalachian State currently holds the system record. LET'S TAKE THEM DOWN! In previous 49ers4Life campus-wide drives, students have been the driving force and the vast majority of donors. Increased participation from faculty, staff and alumni is very much needed. Blood can be safely donated every 56 days. Platelets can be safely given every two weeks, up to 24 times a year. Most healthy people age 16 and older, who weigh at least 110 pounds, are eligible to donate blood and platelets. 49ers4Life is supported by student groups which include HOSA (Health Occupations Students of America), Student Government Association (SGA), 49er Student Athletes, Lambda Chi Alpha, Delta Zeta, Kappa Delta, Chi Omega, Alpha Chi Omega, Alpha Kappa Alpha, Delta Sigma, Men’s Rugby, Zeta Tau Alpha, Kinesiology Student Organization, Public Health Association and MAPS. University Sponsors: Business Services, Barnes & Noble at UNC Charlotte, Chartwells Dining Services, REPROS Copy Center, Union Station, Mail & Package Services and Student Union Activities & Recreation (SUAR).. The Red Cross Carolinas Blood Services Region provides lifesaving blood to 103 hospitals and must have 1,600 people give blood and platelets each weekday to meet hospital demand. The American Red Cross shelters, feeds and provides emotional support to victims of disasters; supplies about 40 percent of the nation's blood; teaches skills that save lives; provides international humanitarian aid; and supports military members and their families. The Red Cross is a not-for-profit organization that depends on volunteers and the generosity of the American public to perform its mission. For more information, please visit redcross.org or on Twitter, @RedCross. Graduating or leaving the University? Your full-time permit is still worth something! Turn it in to the Parking and Transportation Services office for a partial refund. Here’s the link to the refund policy and schedule. Do not sell your permit to another student. UNC Charlotte parking permits may only be bought through PaTS. Permits are registered to a specific person and vehicle. Selling a permit to someone to whom it’s not registered may subject you and them to fines and other penalties. Permits are required to park anytime the University is open. Unable to buy a permit right away? If you are waiting on a financial aid refund or other funds before purchasing a permit, you may buy a temporary permit to hold you over. Price is $6 per day for as many days as you think you'll need. Temporary permits are not available for online purchase. If you bought a full-time permit last semester (C, R, G, 6A or L27), your permit will not expire until 8/15/16. Expiration date is on the back of our permit. Permits for spring semester are available for purchase online (credit or debit card only). Permits ordered by December 21 will be mailed on December 22. Permits ordered after December 21 will be available for pick-up. Thursday January 14: return to normal hours (7:30 am-5:00 pm) in the Parking and Transportation Office (#23 on campus map; brown buidling across from McMillan greenhouse). *Only faculty and staff will be served in the PaTS office on these dates. Road construction schedule for the weekend of December 4 - 6 will close two major intersections: Cameron and Craver (below Student Union at Hauser Alumni Center) and Cameron and Mary Alexander (by Student Health Center and Hawthorn). SafeRide evening transportation will have to alter stop order and route as a result. No interruption in service is expected but the required detours may add time. Remember, the UNCCNextRide app and mobile website shows the location of SafeRide vans and provides an estimate of when each will arrive at your pick-up stop. 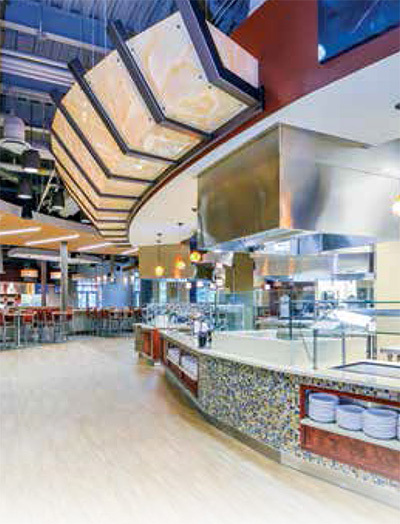 South Village Crossing was the subject of a design feature in the November issue of On Campus Hospitality magazine (a national business publication that focuses on college and university food service). A reprint of the article follows. The new South Village Crossing at the University of North Carolina at Charlotte was built with flexibility in mind. The school also worked with Chartwells to add more options for the increasing number of students with special dietary needs. “We wanted it to be flexible enough, and have areas that we could work with our foodservice partners to incorporate more options for those students, so we wouldn’t have to exempt or make an exception to the meal plan, but to be able to serve those students within the program’s parameters,” said Alvarez. 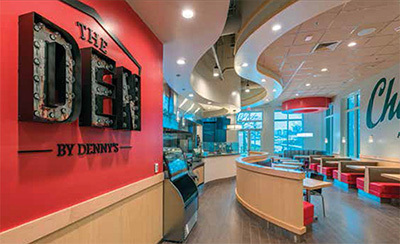 On the first floor of the facility is the all-you-care-to-eat dining area, which has a number of flexible elements. The first station features a salad bar and yogurt parfait station. The stations also feature counters, hardware and food shields from BSI. “The designs are very fluid and the colors change from one section to the other, so it is not all very cookie cutter,” said Alvarez. Beginning Thursday, November 19, road and sidewalk improvements along Mary Alexander Rd. will impact the Fretwell/McEniry shuttle stops (Green, Yellow and Red Lines). The bus shelter on the southbound side will be removed and stops on both sides of the street may move a few yards in either direction. If that's a regular stop for you, expect some fluidity for a couple weeks. Once the construction is complete, the bus shelter will be replaced. Follow @unccparking on Twitter for parking and transportation updates.